There are a ton of water parks in Wisconsin. In fact, Wisconsin Dells rightfully claims the title of the water park capital of the world. When it comes to theme parks and amusement parks, however, the state comes up a bit short. There are no major theme parks, nor does any amusement park chain, such as Six Flags, operate any locations in Wisconsin. There are a few places where you could scream aboard roller coasters and find other rides, including one decent-sized park in the Dells. There used to be more places to find fun in the state, but like many amusement parks from the early 20th century, many of them closed. DandiLion Park in Muskego, for example, opened in 1861 and closed in 1977. During its more than 100 years of operation, it offered four roller coasters, including the wooden Cyclone and Tail Spin rides. Another park, Waukesha Beach, operated from 1893 to 1949 in Pewaukee and offered three woodies, including Bob's and the Hummingbird. The following Wisconsin parks are open. They are listed alphabetically. The small, traditional park park dates back to 1892. Like a few select amusement parks in the country it still offers free admission. Visitors can purchase a-la-carte ride tickets. Parking is also free -- another rarity these days. Rides include Elvis Presley's favorite coaster, the Zippin Pippin, which was relocated from Tennessee. Other vintage rides include a Ferris wheel, bumper cars, and a Tilt-A-Whirl. The Bay Beach Train, which dates back to 1956, takes passengers on a tour around the park. Yes, this is primarily a place to go bowling, but the indoor family entertainment center also offer rides such as go-karts, a small roller coaster, and bumper cars. There is also a trampoline park and an arcade. You may think the folks that operate this small amusement park are spelling challenged. In fact, it is owned by the Merrick family which incorporated its surname into the park's name. Among the classic rides are four roller coasters, including the circa-1953 woodie, The Meteor. There is also a Scrambler, a Roll-O-Plane, and a small monorail. Little Amerricka offers lots of kiddie ridesf, a 2.5-mile train ride through an exhibit of exotic animals, bumper boats, go-karts, and mini-golf. Like Bay Beach, admission is free at the park. The biggest park in the state, Mt. Olympus features lots of go-karts and coasters. (No surprise there, right?) Among the highlights is Hades 360, a wooden coaster that goes underground and includes inversions (hence the name). Some of the go-karts tracks include elevated tracks. Also includes an indoor amusement park. Adjacent outdoor and indoor water parks. The indoor parks are climate controlled and open year-round. Mt. Olympus operates a hotel and includes park tickets with its room rates. 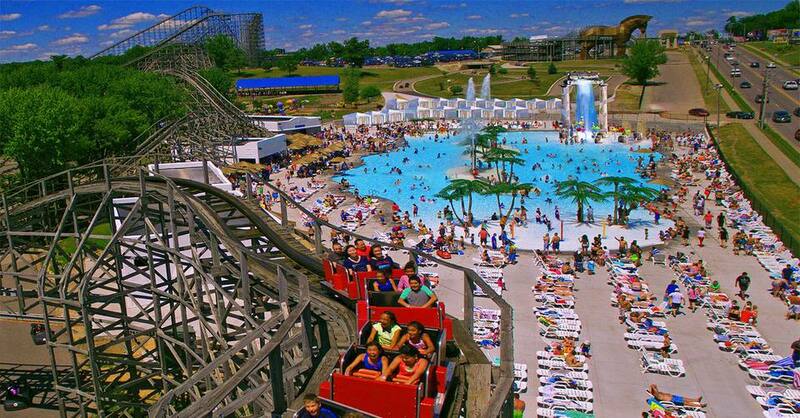 One of the largest outdoor water parks in the country, Noah's Ark also includes a few attractions typically found at amusement parks including a 4-D theater, an arcade, and Flash Flood, a shoot-the-chutes boat ride. Mini-golf is the star here, but Timber Falls offers a few rides including a surprisingly potent wooden roller coaster, bumper boats, and a log flume. Brave thrill seekers may want to try the Skyscraper, which swings 160 feet into the air at 60 mph and delivers 4Gs of fun.